Who was Alan O’Mara? A son, a brother, a journalism student and a footballer. We knew him best as a goalkeeper on the Cavan U21 side, which brought a smile back to the face of Breffni football followers five years ago. Away from the football field, though, here was a young man who was suffering. In time, he gained the courage to do something about it. 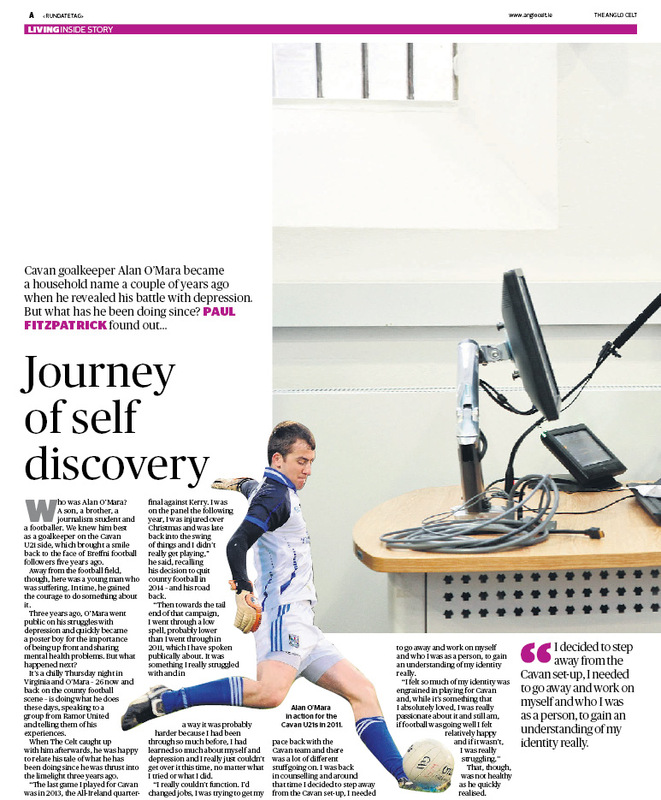 Three years ago, O’Mara went public on his struggles with depression and quickly became a poster boy for the importance of being up front and sharing mental health problems. But what happened next? It’s a chilly Thursday night in Virginia and O’Mara – 26 now and back on the county football scene – is doing what he does these days, speaking to a group from Ramor United and telling them of his experiences. When The Celt caught up with him afterwards, he was happy to relate his tale of what he has been doing since he was thrust into the limelight three years ago. 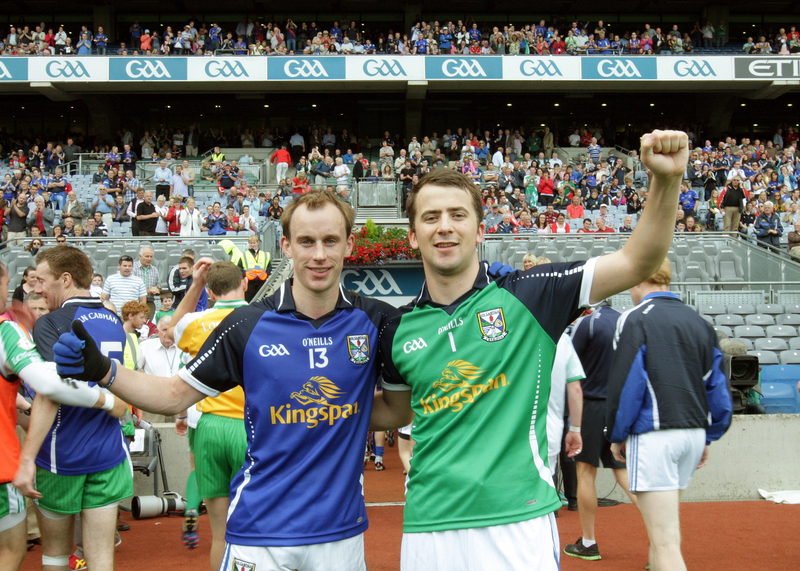 “The last game I played for Cavan was in 2013, the All-Ireland quarter-final against Kerry. I was on the panel the following year, I was injured over Christmas and was late back into the swing of things and I didn’t really get playing,” he said, recalling his decision to quit county football in 2014 – and his road back. “Then towards the tail end of that campaign, I went through a low spell, probably lower than I went through in 2011, which I have spoken publically about. It was something I really struggled with and in a way it was probably harder because I had been through so much before, I had learned so much about myself and depression and I really just couldn’t get over it this time, no matter what I tried or what I did. “I really couldn’t function. 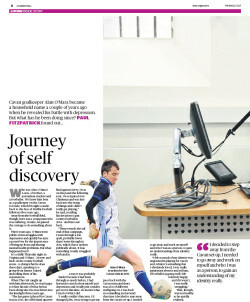 I’d changed jobs, I was trying to get my pace back with the Cavan team and there was a lot of different stuff going on. 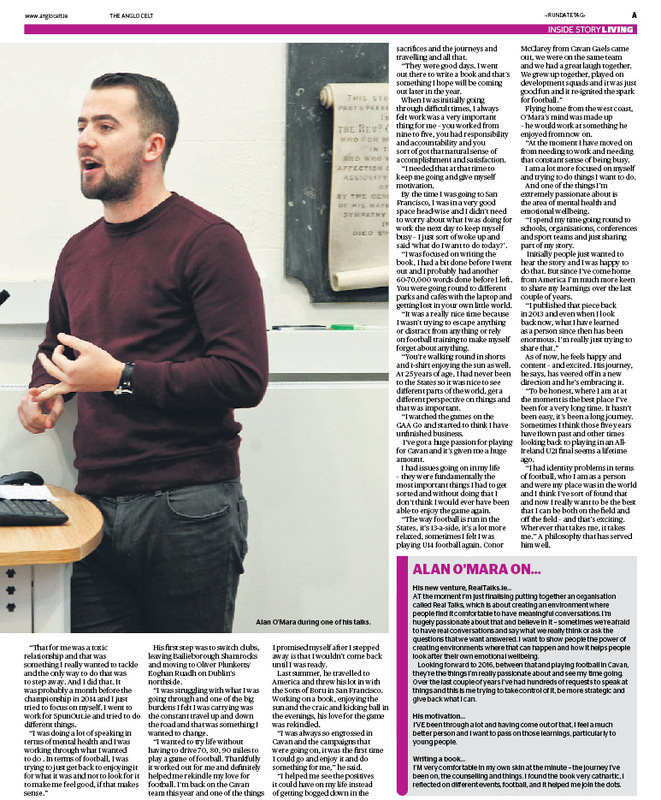 I was back in counselling and around that time I decided to step away from the Cavan set-up, I needed to go away and work on myself and who I was as a person, to gain an understanding of my identity really. That, though, was not healthy as he quickly realised. “That for me was a toxic relationship and that was something I really wanted to tackle and the only way to do that was to step away. And I did that. It was probably a month before the championship in 2014 and I just tried to focus on myself. I went to work for SpunOut.ie and tried to do different things. His first step was to switch clubs, leaving Bailieborough Shamrocks and moving to Oliver Plunketts/Eoghan Ruadh on Dublin’s northside. “I was struggling with what I was going through and one of the big burdens I felt I was carrying was the constant travel up and down the road and that was something I wanted to change. “I wanted to try life without having to drive 70, 80, 90 miles to play a game of football. Thankfully it worked out for me and definitely helped me rekindle my love for football. I’m back on the Cavan team this year and one of the things I promised myself after I stepped away is that I wouldn’t come back until I was ready. Last summer, he travelled to America and threw his lot in with the Sons of Boru in San Francisco. Working on a book, enjoying the sun and the craic and kicking ball in the evenings, his love for the game was rekindled. 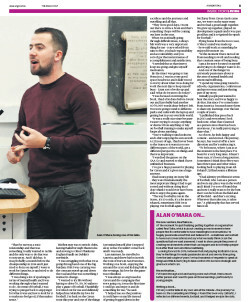 “I was always so engrossed in Cavan and the campaigns that were going on, it was the first time I could go and enjoy it and do something for me,” he said. “I helped me see the positives it could have on my life instead of getting bogged down in the sacrifices and the journeys and travelling and all that. “They were good days. I went out there to write a book and that’s something I hope will be coming out later in the year. When I was initially going through difficult times, I always felt work was a very important thing for me – you worked from nine to five, you had responsibility and accountability and you sort of got that natural sense of accomplishment and satisfaction. “I needed that at that time to keep me going and give myself motivation. By the time I was going to San Francisco, I was in a very good space head-wise and I didn’t need to worry about what I was doing for work the next day to keep myself busy – I just sort of woke up and said ‘what do I want to do today?’. “I was focused on writing the book, I had a bit done before I went out and I probably had another 60-70,000 words done before I left. You were going round to different parks and cafés with the laptop and getting lost in your own little world. “It was a really nice time because I wasn’t trying to escape anything or distract from anything or rely on football training to make myself forget about anything. “You’re walking round in shorts and t-shirt enjoying the sun as well. At 25 years of age, I had never been to the States so it was nice to see different parts of the world, get a different perspective on things and that was important. 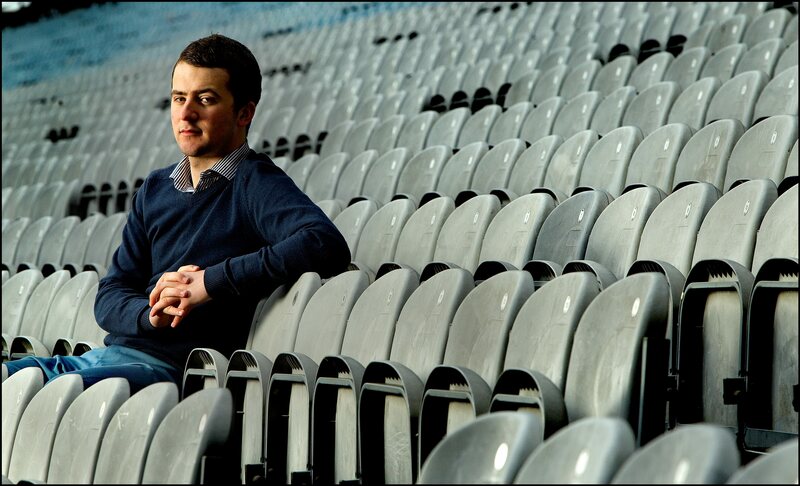 “I watched the games on the GAA Go and started to think I have unfinished business. I’ve got a huge passion for playing for Cavan and it’s given me a huge amount. I had issues going on in my life – they were fundamentally the most important things I had to get sorted and without doing that I don’t think I would ever have been able to enjoy the game again. Flying home from the west coast, O’Mara’s mind was made up – he would work at something he enjoyed from now on. “At the moment I have moved on from needing to work and needing that constant sense of being busy. I am a lot more focused on myself and trying to do things I want to do. And one of the things I’m extremely passionate about is the area of mental health and emotional wellbeing. “I spend my time going round to schools, organisations, conferences and sport teams and just sharing part of my story. Initially people just wanted to hear the story and I was happy to do that. But since I’ve come home from America I’m much more keen to share my learnings over the last couple of years. As of now, he feels happy and content – and excited. His journey, he says, has veered off in a new direction and he’s embracing it. “To be honest, where I am at at the moment is the best place I’ve been for a very long time. It hasn’t been easy, it’s been a long journey. Sometimes I think those five years have flown past and other times looking back to playing in an All-Ireland U21 final seems a lifetime ago. At the moment I’m just finalising putting together an organisation called Real Talks, which is about creating an environment where people find it comfortable to have meaningful conversations. I’m hugely passionate about that and believe in it – sometimes we’re afraid to have real conversations and say what we really think or ask the questions that we want answered. I want to show people the power of creating environments where that can happen and how it helps people look after their own emotional wellbeing. Looking forward to 2016, between that and playing football in Cavan, they’re the things I’m really passionate about and see my time going. Over the last couple of years I’ve had hundreds of requests to speak at things and this is me trying to take control of it, be more strategic and give back what I can. I’ve been through a lot and having come out of that, I feel a much better person and I want to pass on those learnings, particularly to young people. I’m very comfortable in my own skin at the minute – the journey I’ve been on, the counselling and things. I found the book very cathartic, I reflected on different events, football, and it helped me join the dots.